On November 20, the U.S Treasury sanctioned six individuals and three entities for providing millions of barrels of oil to the Syrian regime. The Office of Foreign Assets Control said that Russia facilitated the delivery of Iranian oil to Syria. The Assad government then transferred money to the Islamic Revolutionary Guard Corps Qods Force, which forwarded funds to Lebanese Hezbollah and Hamas. “Central Bank of Iran officials continue to exploit the international financial system, and in this case even used a company whose name suggests a trade in humanitarian goods as a tool to facilitate financial transfers supporting this oil scheme,” said Treasury Secretary Steven Mnuchin. “Today’s sanctions, in conjunction with economic, diplomatic, and other strategic initiatives, are part of the U.S. government’s long-term maximum pressure campaign to counter the Iranian regime’s influence and destabilizing regional activities, to deny it the funds it uses to bankroll terrorist and militant proxies, and to secure the removal of all Iranian forces from Syria,” the State Department added. The following are press statements from the Treasury and the State Department. Today, the U.S. Department of the Treasury’s Office of Foreign Assets Control (OFAC) is designating nine targets in an international network through which the Iranian regime, working with Russian companies, provides millions of barrels of oil to the Syrian government. The Assad regime, in turn, facilitates the movement of hundreds of millions of U.S. dollars (USD) to the Islamic Revolutionary Guard Corps-Qods Force (IRGC-QF) for onward transfer to HAMAS and Hizballah. U.S. sanctions prohibit material support to the Government of Syria, including shipments of oil to Syrian government-controlled ports, as well as material support to designated terrorist groups. Today’s designations target critical actors in this scheme, including Syrian national Mohammad Amer Alchwiki (Alchwiki) and his Russia-based company, Global Vision Group. Alchwiki and his company are central to (1) the delivery of oil from Iran to Syria, and (2) the transfer of funds to the IRGC-QF’s lethal proxies. Today’s designations also highlight the important role that Central Bank of Iran (CBI) officials play in facilitating this scheme. Throughout the Syrian Civil War, the Iranian regime has continued to provide military and financial support to the Assad regime, enabling it to commit mass atrocities against the Syrian people. The Iranian regime also continues to fund terrorism, providing hundreds of millions of dollars to its regional proxies and U.S.-designated terrorist organizations, HAMAS, and Lebanese Hizballah (Hizballah), further destabilizing the region. All the while, Iranian citizens suffer from their government’s neglect and corruption, including through a lack of stable food and water supplies, electricity, and other essential needs. U.S. sanctions prohibit material support to the Assad regime and U.S.-designated terrorist groups, including the IRGC-QF, HAMAS, and Hizballah. All assets subject to U.S. jurisdiction of the individuals and entities added to the Specially Designated Nationals List (SDN List), and of any other entities blocked by operation of law as a result of their ownership by a sanctioned party, are frozen, and U.S. persons are generally prohibited from dealings with them. 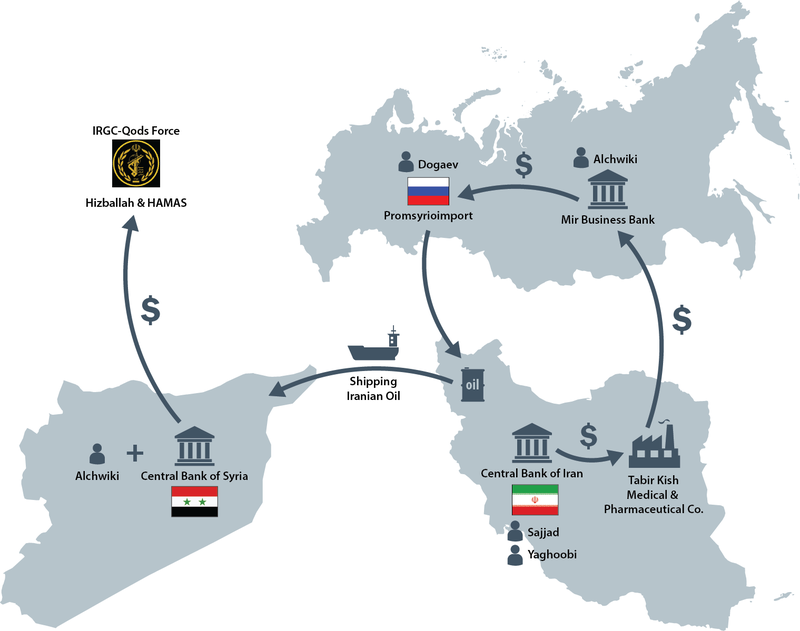 Using an array of mechanisms designed to obfuscate their activities, Alchwiki’s Russia-based Global Vision Group coordinates with the National Iranian Oil Company (NIOC) to remit payment for oil being shipped to Syria. Global Vision Group does this by working with state-owned Russian company Promsyrioimport, a subsidiary of the Russian Ministry of Energy (Minenergo), to facilitate shipments of Iranian oil from NIOC to Syria. To deliver the oil from Iran to the Syrian regime, Global Vision Group uses a number of vessels, many of which have been insured by European companies. Since at least 2014, vessels carrying Iranian oil have switched off the Automatic Identification System (AIS) onboard before delivering oil to Syria, as a means of concealing the true destination and recipient of this Iranian oil. Today, OFAC is issuing an Advisory to the maritime community regarding the sanctions risks of shipping oil to the Government of Syria, including a non-exhaustive list of vessels that have delivered oil to Syria since 2016. To assist Syria in paying Russia for this oil, Iran sends funds to Russia through Alchwiki and Global Vision Group. To conceal its involvement in these transactions, the CBI makes these payments to Mir Business Bank using Iran-based Tadbir Kish Medical and Pharmaceutical Company (Tadbir Kish). Despite the reference to humanitarian goods in Tadbir Kish’s name, the company has repeatedly been used to facilitate illicit transfers in support of this oil scheme. Following the CBI’s transfer of funds from Tadbir Kish to Global Vision Group in Russia, Global Vision Group transfers payment to Russia state-owned Promsyrioimport to pay for the oil. Mir Business Bank was designated on November 5, 2018, pursuant to Executive Order (E.O.) 13224, and is a wholly-owned subsidiary of Iran’s Bank Melli, which was designated for acting as conduit for payments to IRGC-QF. CBI senior officials play a critical role in this arrangement. Rasul Sajjad, CBI’s International Department Director, and Hossein Yaghoobi, CBI’s Vice Governor for International Affairs, have both assisted in facilitating Alchwiki’s transfers. Andrey Dogaev, First Deputy Director of Promsyrioimport, has worked closely with Yaghoobi to coordinate the sale of Iranian crude to the Government of Syria. Through this scheme, Promsyrioimport, working with Global Vision Group, has exported millions of barrels of Iranian oil into Syria. This scheme has also funneled millions of dollars between the CBI and Alchwiki’s Mir Business Bank account in Russia. In addition to the scheme above, Alchwiki also acts as a critical conduit for the transfer of hundreds of millions of USD banknotes to Iranian proxies in the Levant, including U.S.¬ designated foreign terrorist organizations and specially designated global terrorist groups Hizballah and HAMAS. Using the Central Bank of Syria, Alchwiki coordinates the transfers with Hizballah official Muhammad Qasir, who heads the Hizballah unit responsible for facilitating the transfer of weapons, technology, and other support from Syria to Lebanon. 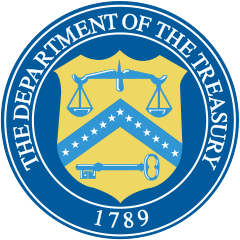 OFAC designated Qasir on May 15, 2018, for acting for or on behalf of Hizballah. The United States today sanctioned an international network by which the Iranian regime and Russia are providing millions of barrels of oil to the Assad regime in exchange for the movement of hundreds of millions of dollars to the Islamic Revolutionary Guard Corps-Qods Force, and for onward transfer to terrorist organizations such as Hamas and Hizballah. The sanctions levied today directly target the Iranian regime’s exploitation of the international financial system to hide revenue streams it uses to fund terrorist activity, provide support for sectarian militias responsible for abuses against civilian populations, and destabilize the region. The Iranian regime, Iranian-commanded forces inside Syria, and the proxy terrorist groups it supports such as those targeted today, continue to foment instability to extend their malign influence. These actions by the Iranian and Assad regimes undermine the legitimate processes to resolve the conflict in Syria. Today’s sanctions, in conjunction with economic, diplomatic, and other strategic initiatives, are part of the U.S. government’s long-term maximum pressure campaign to counter the Iranian regime’s influence and destabilizing regional activities, to deny it the funds it uses to bankroll terrorist and militant proxies, and to secure the removal of all Iranian forces from Syria. They are also part of the United States’ effort to bring to bear on the Syrian regime the pressure necessary to help bring about a political resolution of the Syrian conflict. Disrupting the illicit network that we have designated today is a crucial element of a broader effort to disrupt the material ties between the Assad regime and its IRGC patrons. This effort will continue in the months to come. We are committed to imposing a financial toll on the Iranian regime, Russia, and others who prop up the Assad regime and enable its abuses, as well as to disrupt the Iranian regime’s funding of terrorist organizations. The United States will use every available tool to combat the Iranian regime’s destabilizing and destructive influence in Syria and throughout the region.